How Hard is It to Use Craigslist to Get Cash for My Car in Vancouver? You’re ready to move on, eh? Maybe your car is dying and not worth the price of repair. Maybe it just doesn’t suit your style anymore. Or maybe you’ve been driving used for years and have finally saved up to buy new. Whatever the reason for deciding to ditch your vehicle, you’ve probably got one question on your mind: how can I get cash for my car in Vancouver, WA? So you Google your way around the internet a bit, determine its exact blue book value, and discover that the best price estimated by all those online calculators comes from selling directly to a buyer. It makes sense if you think about it. A buyer has no overhead. They aren’t looking to make a profit, they’re looking to get a new (used) ride. A dealer, on the other hand, takes the risk that the car won’t ever sell—so they can’t offer you as much if they want to turn a profit. When it comes to finding a buyer, you may be tempted to turn to the Vancouver section of Craigslist. What better place to make a quick sale than the largest online classified listing on the internet? Right? Selling on Craigslist comes with a lot of hassle that you may not have considered. Let’s take a look at some of the headaches you’ll have to deal with. Typically, if you are selling to an independent owner, you’ll need to arrange to meet them at the DMV so that you can sign over the title. You know what that means: standing in lines, waiting for numbers to be called, and dealing with the top-notch customer service so typical of government institutions. Not to mention you’ve got to count on the buyer to show up on time with all of their paperwork in order. And, beyond just the transfer documents and bill of sale, the buyer may request that you provide additional documentation, such as a maintenance report or odometer disclosure. “Yay! More forms,” said no one. Ever. Would you buy a car from a dealer without a test drive? I didn’t think so. So don’t expect your average Craigslist buyer to do so either. If you get ten interested buyers, that’s ten strangers you have to meet and ten awkward test drives you have to facilitate. Where to meet? If you meet at your place, that means you’re providing your home address to several unknown people. And, while most are good people, there are plenty of unscrupulous types out lurking online. Do I stay in the car during the test drive? You’re putting yourself at risk whether you let them drive the car with or without you. If you don’t get in the car, you make yourself a target for thieves and scammers. If you do stay in the car, well… you have no idea where a simple test drive could end up. Do I need a friend? A good practice when selling anything on Craigslist is to ask a buddy to come along when meeting a buyer. But that doubles the time you need to spend coordinating because now you’ve got to take into account the schedule of both the buyer and your buddy. It could take weeks or even months to find a buyer who’s really interested in your car. But what if they aren’t interested in your price? Do you really think you’ll have the mental reserve to haggle for the price you deserve after all the time you’ve spent dealing with potential buyers? Odds are, you’ll take the first offer someone makes, and after calculating in all the hours you put in trying to sell your car, it’s doubtful that you’re getting back what you put in. Now that you know the hassles, sell on Craigslist at your own risk. It will take you longer than you think, earn you less than you expect, and potentially put you at more risk than anyone needs. No DMV. Skip the lines. We’ll handle all of the paperwork. All you need to provide is the title to your car and we’ll take it from there. You don’t even need to drive it to us. It doesn’t even need to run! We’ll happily tow your car away free of charge. No Negotiations. Our process is simple: You contact us. We give you a quote. If you accept it, we take your car away and leave cash in your hands. No pressure. Just cash. So if you want to keep looking into the Craigslist option, be our guest. But be ready for some headaches. 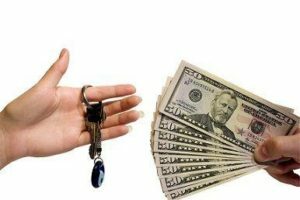 If you want cash for your car in your hands within 24 hours, give us a call today.